It was a surprise to see so many sketches and even paintings by Jack Kerouac at the New York Public Library’s marvelous, extensive exhibit, Beatific Soul. There they were, along with his notebooks and manuscripts. An ardent lover of his prose, I viewed his artwork differently than you might expect and found it difficult to look too closely at it. That is a telling reaction based on my own experience. During some periods of my life, usually the sad times, writing wasn’t a large enough platform and I have sketched, painted in watercolors and acrylics and drawn. My efforts were wooden, but they were not intended as art. Nor do I believe Kerouac intended for these to be viewed as art. Or possibly, even viewed at all. Rather, these visual artworks show the depth of Kerouac’s deeply human striving, to express something profound that was fully integrated into his person. The artwork, like his writing, is his cry to the universe, Hear me, I have something to say that offers a different, somehow more meaningful, version of the perceived world. He also completed these visual artworks in the early 1960s, when he was facing great inner turmoil related to his runaway success, the rise of his drinking problem and his ongoing inability to find love. ABOVE: Jack Kerouac. 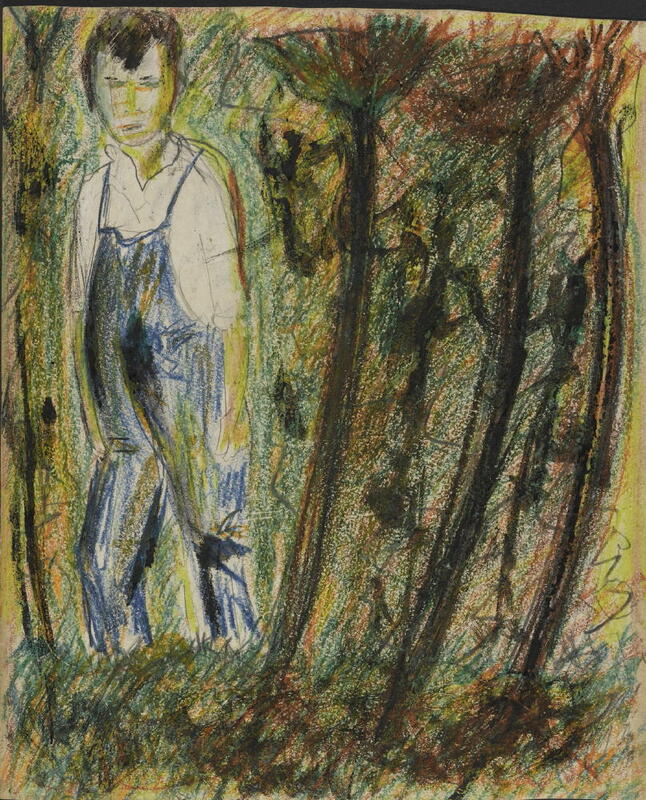 “Self-Portrait as a Boy.” Oil, crayon, charcoal, pencil, and ink on paper, ca. 1960. New York Public Library, Berg Collection. Reproduced courtesy of John G. Sampas, legal representative of the estates of Jack and Stella Kerouac. This entry was posted on March 4, 2008 at 5:06 am and is filed under Uncategorized. You can follow any responses to this entry through the RSS 2.0 feed. You can leave a response, or trackback from your own site.